"This English sandwich is definitely different, but really hearty and yummy. It is great to eat on camping trips or to send with your hubby while he is hunting. This recipe is very basic in measurements and can be adjusted as desired for the most part. The doneness of the meat can be adjusted as well. Hope you like it!" Heat 1 tablespoon of vegetable oil in a large, heavy skillet over high heat until the oil is slightly smoking; lay the beef round steak into the hot skillet, and cook until the outside of the meat is browned and crusty and the inside is your desired degree of doneness, 5 to 8 minutes per side for medium-rare. Remove the steak, and set aside. Heat the remaining 2 tablespoons of vegetable oil in the skillet, and cook and stir the onion, mushrooms, and garlic until the onions are translucent and the mushrooms have given up their juice, 5 to 8 minutes. Remove from heat, and set aside. 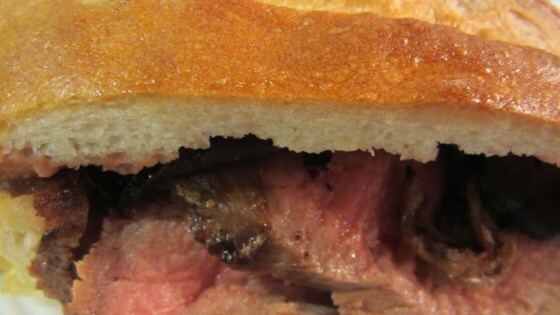 Lay the cooked steak into the hollowed-out bread loaf, and pile the onions, mushrooms, and garlic over the steak. Replace the bread "lid," and wrap the whole loaf in aluminum foil. Place the loaf onto a baking sheet; place a heavy flat weight on top of the loaf, such as a board or a heavy skillet, and weight the top with several bricks or jars of water. Place the loaf with its weights into the refrigerator, and chill and press the sandwich for at least 6 hours. To serve, bring to room temperature, and cut off slices of the loaf. Layers of seared steak and sautéed mushrooms star in this pressed sandwich. Amazingly simple but tastes so good. You don’t even need the garlic but will try it next time.